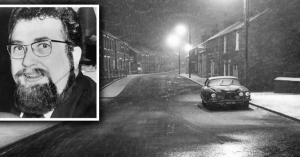 On 5th January, 1967, the body of Angus Sibbet, a coin collector for the infamous northeast yet London-born â€˜Slot-Machine Kingâ€™ Vince Landa, was found shot to death in his Mark 10 Jaguar under a bridge just outside of Newcastle. Sibbet had allegedly been skimming Landaâ€™s profits for years, and living way beyond his means. The 1960s northeast slot-machine (one-armed bandit) gangland wars and Sibbetâ€™s murder inspired the classic British gangster film Get Carter starring Michael Caine. Two men, Dennis Stafford and Michael Luvaglio, who also worked for Vince Landa, served twelve years for their friend Angus Sibbetâ€™s murder, before being released in 1980. They are still convicted killers. It is widely thought that they were and are innocent. Vince Landaâ€™s slot-machine empire, Social Club Services Ltd, was turning over very serious money by 1967, thought to worth around Â£12 million, then an enormous sum. It was even being prepared for flotation on the stock exchange. But it was undoubtedly a crooked enterprise, with the company supplying slot-machines as well as refurbishment services to working menâ€™s clubs all over the northeast of England, Landa living in a sprawling mansion in Bishop Auckland, which was used as a location in the film Get Carter. The infamous Kray twins from London even went up to Newcastle on several occasions and tried to muscle in on Landaâ€™s empire. But Social Club Services was undoubtedly a crooked enterprise, with social and working menâ€™s clubs being ripped off with secret slot-machine hopper drawers and skimming from machine takings, Angus Sibbet was thought to have been guilty of the latter over a period of several years. Sibbet was found shot to death in his expensive Jaguar, and Dennis Stafford, a self-confessed career criminal, but one who had never used violence, and Michael Luvaglio, the brother of his boss Vince Landa (real name Luvaglio), who had no criminal record at all. They were convicted on circumstantial evidence - damage to the car they were driving, which actually belonged to Landa, and which was controversially and dubiously matched to damage done to Sibbetâ€™s Jaguar, even though the car was vandalised outside of The Birdcage nightclub in Newcastle, where London natives Stafford and Luvaglio were waiting to meet their colleague Angus Sibbet for a business meeting just after midnight on 5th January 1967. Sibbet never arrived, his dead body was found sprawled under a lonely bridge on a bitterly cold dawn by a miner, Tom Leak, coming off shift at a nearby pit. There was no motive to prove that Stafford and Luvaglio wanted Sibbet, their friend, dead, even if their boss Vince Landa, who died in 2011, possibly could have. Numerous witness statements placed Stafford and Luvaglio elsewhere in the timeframe alloted to Sibbetâ€™s murder that morning, and the estimated time of death itself was circumpsect, as Sibbetâ€™s body temperature wasnâ€™t taken immediately when the doctor arrived at the scene, and questions over rigor mortis raise serious doubts about the prosecutionâ€™s estimated time of death. When all the evidence is looked at in detail, brilliantly laid out in David Lewis and Peter Hughmanâ€™s book about the case Most Unnatural, published by Penguin in 1970, just three years after Sibbetâ€™s murder, and just a little less after Stafford and Luvaglioâ€™s murder convictions, serious and glaring doubts about the convicted menâ€™s guilt emerge. It certainly seems to be a miscarriage case where the evidence was put together and tailor-made to fit Stafford and Luvaglioâ€™s guilt, probably a case of blinkered police tunnel vision. It is far more likely that Angus Sibbet was killed professionally by a hitman, probably hired from outside of Newcastle, Sibbet being lured to that desolate place, and the car which Stafford and Luvaglio were driving damaged to implicate them. The convictions just do not stack up when all the prosecution evidence is taken into consideration, and measured against other evidence which points to Stafford and Luvaglioâ€™s innocence of this terrible crime. Dennis Stafford and Michael Luvaglio are both still alive and elderly. Stafford lives in the northeast and Luvaglio in London. On 5th January 2017, on the fiftieth anniversary of Angus Sibbetâ€™s murder, Michael Luvaglio, now aged 80, gave a long interview to Mike Sullivan, crime editor of the Sun, during which he cried. Now seriously ill, almost thirty-seven years after he was released from prison after serving twelve years, Luvaglio doesnâ€™t want to die a convicted murderer. Luvaglioâ€™s application for a third Court of Appeal ruling was rejected by the CCRC in early January 2017. If something is not done soon, Michael Luvaglio could well die with this miscarriage standing, his name forever tainted, and Dennis Stafford also risks this final injustice.